President Buhari Approves Appointment Of 29 New Justices – Royal Times of Nigeria. 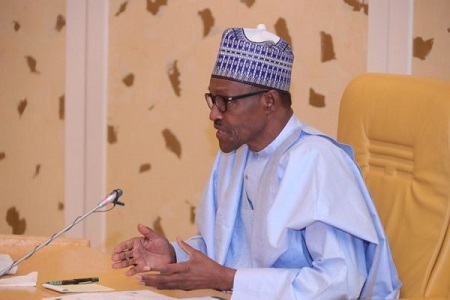 President Muhammadu Buhari yesterday approved the appointment of 29 judicial officers for the country’s judiciary. A breakdown of the figure shows that 12 Justices were approved for the Court of Appeal, 9 for Federal High Court and 7 for FCT High Court. Buhari’s approval was based on the recommendation of the National Judicial Council. The twelve (12) Justices approved for the Court of Appeal are: Hon. (Mr) Justice P. A. Mahmud, Hon. (Mr) Justice F. O. Ojo, Hon. (Mr) Justice I. A. Andenyangsto, Hon. (Mr) Justice G. O. Kolawole, Hon. (Mr) Justice B. B. Aliyu, Hon. (Mr) Justice Ebiowei Tobi, Hon. (Mr) Justice J. G. Abundaga, and Hon. (Mr) Justice A. S. Umar. Others okayed for the appellate court include, Hon. (Mr) Justice A. M. Talba, Hon. (Mr) Justice A. M. Bayero, Hon. (Mr) Justice A. M. Lamido, and Hon. (Mr) Justice M. B. Idris. The following nine (9) Judges were approved for the Federal High Court:- Sunday Bassey Onu, Mrs. Adefunmilola Adekemi Demi-Ajayi, Hon. (Mr) Justice Peter O. Lifu, Obiora Atuegwu Egwuata, Sa’adatu Ibrahim Mark (Mrs) and Mobolaji Olubukola Olajuwon. Others are Aminu Bappa Aliyu, Tijjani Garba Ringim and Nkeonye Evelyn Maha. The Seven (7) Judges for the High Court of the Federal Capital Territory are as follows: Binta Mohammed, Modupe Osho-Adebiyi, Gaba Venchak Simon, Babangida Hassan, Akobi Iyabeni Anna, Samirah Umar Bature and Asmau Akanbi Yusuf. A statement signed yesterday , by Soji Oye, Director Information, NJC, indicated that the Justices of the Court of Appeal would be sworn-in by the Hon. Chief Justice of Nigeria and Chairman, National Judicial Council, Hon. 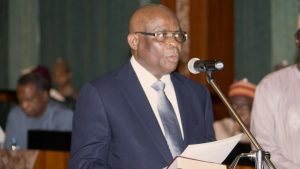 (Mr) Justice W. S. N. Onnoghen, GCON, on Friday 22nd June, 2018. “Those appointed for the Federal High Court will be sworn-in on Monday 25th June, 2018, and Judges appointed for the High Court of the FCT are to be sworn-in on Tuesday, 26th June, 2018, at the Main Hall of the Court Room of the Supreme Court of Nigeria.